Past research on probing-based network monitoring provides solutions based on preplanned probing which is computationally expensive, is less accurate, and involves a large management traffic. Unlike preplanned probing, adaptive probing proposes to select probes in an interactive manner sending more probes to diagnose the observed problem areas and less probes in the healthy areas, thereby significantly reducing the number of probes required. Another limitation of most of the work proposed in the past is that it assumes a deterministic dependency information between the probes and the network components. Such an assumption can not be made when complete and accurate network information might not be available. 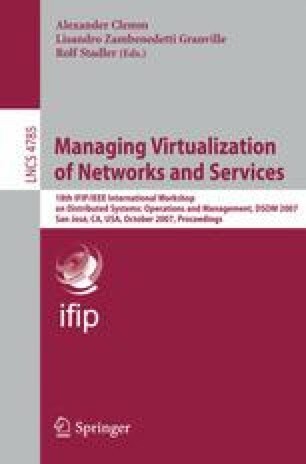 Hence, there is a need to develop network monitoring algorithms that can localize failures in the network even in the presence of uncertainty in the inferred dependencies between probes and network components. In this paper, we propose a fault diagnosis tool with following novel features: (1) We present an adaptive probing based solution for fault diagnosis which is cost-effective, failure resistant, more accurate, and involves less management traffic as compared to the preplanned probing approach. (2) We address the issues that arise with the presence of a non-deterministic environment and present probing algorithms that consider the involved uncertainties in the collected network information. Prepared through collaborative participation in the Communications and Networks Consortium sponsored by the U.S. Army Research Laboratory under the Collaborative Technology Alliance Program, Cooperative Agreement DAAD19-01-2-0011. The U.S. Government is authorized to reproduce and distribute reprints for Government purposes notwithstanding any copyright notation thereon.